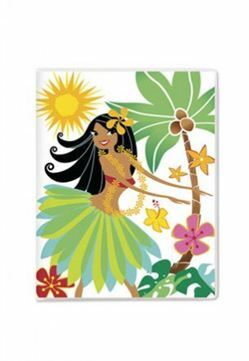 Store your memories in our soft vinyl-covered Island Hula Honeys photo album. It is perfect for carrying in your purse or briefcase to show friends, relatives and co-workers the highlights of your Hawaiian vacation. The 32-View Photo Album has 16 pages with 32 pockets for 4" x 6" photographs. Cover image can be replaced with one of your favorite photographs if desired. Album measures 5" x 6-1/2" .